Technically I wrote this yesterday, but I had a super busy day and didn’t want to publish it without the final edit. That would be against my religion. Or something. So anyway, here is my catch up post and I’ll be back later today with another Simplify topic. Thanks for following along in this series! I have several friends and family members who are total pros at this hospitality thing. Party planning, get togethers, hostessing…it’s all right up their alley. I, on the other hand, have to be very intentional in this area. It does not come naturally to me. But for those of you who would fall in the same category as me, we have to remember not to let this be an excuse to shy away from community. I’m learning what it really means to be hospitable, and I think we sometimes miss the mark. It’s much less about a spotless house and flawless meal, but providing the space for people to come as they are and just be together. It’s really about being people-focused. Now THAT is something I can do. I can facilitate togetherness. It does not have to be fancy. I repeat: It does not have to be fancy. I’m currently co-hosting a book club for Jen Hatmaker’s For the Love, and one of the topics we talk a good deal about is how we complicate this hospitality thing. Can you throw together some pasta? A burger? Anything? Okay, then you can gather people around your table. A dining table is sacred ground, and is the place where people tend feel safe enough to tell their stories. As far as the food, no one really cares, because hey, it’s a break from planning a meal themselves! A low-key, simple vibe is probably more welcoming for vulnerability and genuine conversation anyway. I’ve also been reading and listening to Shauna Niequest lately, and one thing she says is that people should feel better about themselves after leaving your house, not better about you. That’s something I think I can do. I may serve you a burger on a paper plate and tell you where the ice is instead of getting it for you, but I think you’ll feel welcome and loved here, even if you are unimpressed with my (lack of) hostessing skills. Again I say, it does not have to be fancy. 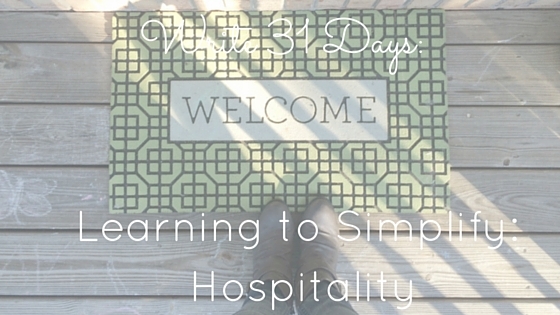 Here’s what hospitality requires: an open heart and an open space. That’s it. That space can be your home, for sure. It can also just be your front porch. It can be a shared park bench with another mom. It can be your car as you carpool to work or an event. Let’s not forget the purpose of hospitality which is cultivating community. And friend, that can be done anywhere. I’m challenging myself to be more intentional with a hospitable mindset. If you’re like me and it doesn’t come naturally to you, that’s okay. Just start simple – plan a hot chocolate and s’more roasting party at your home for one or two other couples. Snacks and conversation – easy!